The holiday weekend provided an opportunity to get back out on the kayak. I wanted to get out in Lake Erie but was worried about the wind and subsequent wave height. For once, I felt like I made a thoughtful well calculated plan, and chose to put in at Emerald Necklace Marina on the Rocky River. It was close enough to the mouth that I could paddle to the lake, yet if conditions were bad I could just stay in the river. So I put my plan into action and sure enough the lake was far to choppy for me to feel safe. I did not use good judgment as I was compelled to go out and ‘test it’, but dumping would never be a good way to say, “yes I was right, too poor of conditions”. My novice status as a kayak fisherman was also evident by my failure to realize I had left the scupper plugs in. A self bailing sit on top does no good when soaked if the plugs aren’t out. Lesson learned. While I was disappointed to be heading back into the river, I still had great expectations of good fishing and maybe would get into some Smallmouth Bass, Channel Catfish, or Common Carp. Reports had all of these species being picked up in good numbers recently. While highly unlikely, I also thought maybe I stood a chance at a Steelhead heading back out to the lake. As the day went on and the fishing was slow, I went from wondering what I was going to catch to wondering if I was going to catch at all. It may have been due to all the boat traffic and recreational paddlers, maybe the people and dogs splashing in the water, but the end result was nothing happening as far as fish. I’m never one to give up easily and after multiple lure changes, I settled in on using a Blue Fox Super Vibrax. I’m a big fan of inline spinners and this is one of my favorites. After 5 or 10 minutes, I felt my first nudge of the day and a few casts later I had my first fish, a small drum. As slow as the fishing was, I appreciated anything willing to bite and that included a small non noteworthy fish. 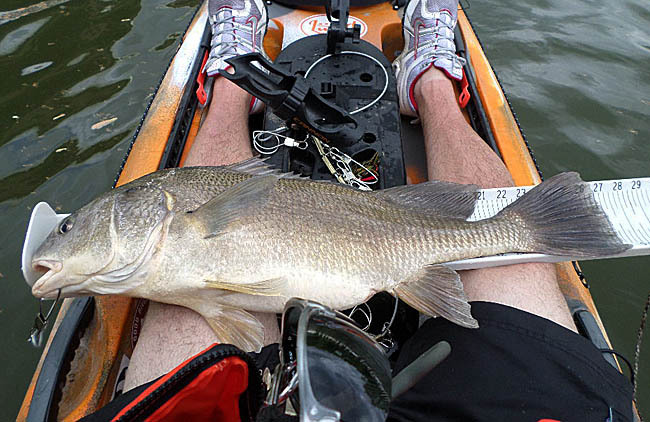 I also have to say that any catch from the kayak is celebrated, as it is a newer experience. I decided I would just keep throwing the same lure and it paid off in consistent catches, albeit small to medium sized drum. They fight plenty good for their size and I wasn’t looking for a meal, so it suited me fine. I remained optimistic that eventually something else would come along, but if it didn’t at least I was catching. As I was nearing my time to quit for the day, I had a massive strike and my drag immediately was screaming. I was pulled to the center of the river rather quickly and was fortunate that traffic was light at this time. A few recreational yakers moved out of the way and proceeded to have some entertainment, I also noted a considerable amount of shore fisherman and onlookers watching the battle ensue. I figured it was a drum as it was reluctant to do anything other than hug the bottom as it fought, but it was remarkable in it’s ability to change direction and I found myself fighting it at various times from either side of the kayak. Landing it was no easy task, but after 5 or 6 minutes I got it in the net. I have to admit I was not expecting a fish of this size and it was truly the most fun fish to catch in a very long time. I put the fish on a stringer just to help control it for the photo op and it also proved to help with reviving for release. While I know a good majority of angler’s will simply say, “it’s just a drum”, I love catching the rough fish and less widely accepted and targeted species. This was the largest I have ever caught and a welcomed upgrade on my life list. 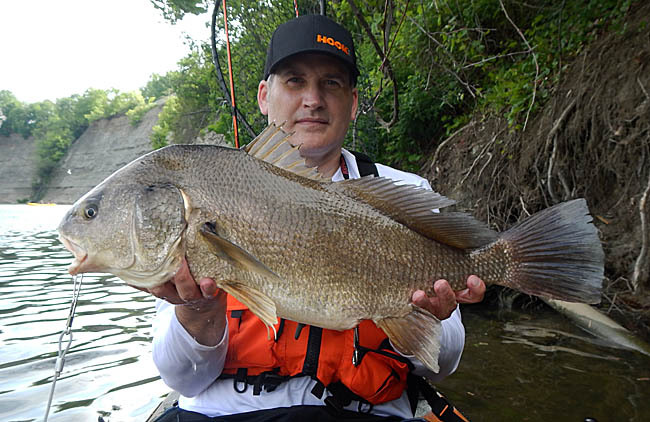 It far exceeded the 22″ necessary for Fish Ohio Award and gave me quite the memory. Call it a Sheephead, Reef Donkey, or whatever you want, I’ll call it a trophy. Nothing wrong with, “rough fish” still put a bend in a rod and salvage a day! That’s a hellllluva drum and a great yak fish!! I need to get you on some king salmon this fall! I will take you up on that offer Nick!, that would be awesome! Thanks Sam! Glad you enjoyed the read and thank you for sharing.